June 1999 - I'd just finished my two year teaching stint in mainland China and was capping it off with a two week reunion with my family in Taiwan before heading back to San Francisco. My family, my mother especially, was relieved that I was finally done with my low-paying, virtually volunteer service; they now expected me to start a well-paying career in earnest. Little did they suspect that, while in China, I had gotten hooked on the notion of becoming a filmmaker. While I was in Taiwan, I got a hold of one of my college classmates, Lee-hom Wang. While I was helping underprivileged students learn to speak and write in English, Lee-hom was becoming the most popular singer in Taiwan (and later in China - look for him this fall starring opposite Tony Leung in Ang Lee's Lust, Caution). When we talked he mentioned that he had just auditioned for a role in a new film by a really impressive and accomplished Taiwanese director. He told me that if I wanted to break into film in Taiwan I should look this guy up. He gave me a slip of paper with three characters written on it: Yang De Chang. The name meant nothing to me at the time. I asked my family if they knew who Yang Dechang was. My grandfather nearly exploded. "Yang Dechang, that scoundrel! You don't want to get involved with him! He abandoned his wife! The man has no morals!" My grandfather implored me not to get involved in the movie business: as far as he was concerned it was saturated with crooks. So much for my potential apprenticeship with Edward Yang. Two years later I moved away from my family in San Francisco to pursue filmmaking in New York City. I get chills now just thinking about how eager and voracious I was about all things film at that time. For the first couple of months, it seemed that every trip to a movie theater gave me a monumental experience that reaffirmed what kind of movies I loved most and someday hoped to make: Pather Panchali, the first film I saw in New York; Jia Zhang-ke's Platform, my first and still my most cherished experience at the New York Film Festival; and of course, Yi Yi, which I saw upon its release in Film Forum. Twice. 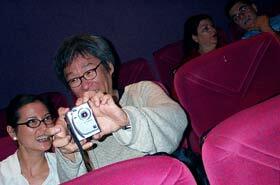 The first time just to see what the first Taiwanese film to win the Grand Prix at Cannes looked like, and the second time to bring my girlfriend and future wife to show her what kind of movies I intended to make. I loved the quiet yet unmistakable ambition behind his artistic and social vision. He wanted no less than to capture how real life worked; it's everyday interactions, it's ebb and flow of desire, desperation and inexplicable outbursts of raw, violent feeling; the mix of quiet acceptance and accumulating disappointment. I think there are fewer films that resonate with how I experience life both in terms of perception and emotion. I confess that I felt a tremendous amount of despair when I saw Yi Yi because, as the saying goes, why do what's already been done? Except that perhaps I could make a film like this in America. I remember writing an email to Roger Ebert's "Answer Man" website when he gave Yi Yi a three and a half star review after lauding American Beauty with four stars. I asked him if he didn't see how Yi Yi was like a Taiwanese version of American Beauty, only better, because it was less invested in histrionics and flagrant bad behavior and keyed into something more subtle, more real, more disturbing and honest. I never got a response but obviously I had already answered my own question. America needed its own Yi Yi. Maybe The Sopranos is as close as it'll ever get, which to my mind still isn't close enough. Yang chose to follow his parents, who had left Taiwan, to Seattle, where he worked in a research laboratory dedicated to defense work involving microcomputers. While he was successful in this line of work, he was also dissatisfied, and increasingly desirous to return to his experiment with filmmaking. A chance encounter, in a Seattle repertory theater, with Werner Herzog's Aguirre, Wrath of God (1972), gave Yang the distinct sensation that where film school had failed to teach him much, self-instruction in world cinema classics would provide him with the necessary groundwork for a future in filmmaking. Yang's interest in film was renewed, but it would be three years before he got his first opportunity, when asked by a friend to write a script for him, which eventually became The Winter of 1905 (1981). He went back to Taiwan to work on the script, and later assisted in its production as well. Following the completion of this film, Yang was offered a chance to write and direct a made-for-television film in Taiwan, Desires (1982). He jumped at the offer, and has stayed in Taiwan since, not returning to the U.S. Sprawling in scope and yet microscopically precise in its observations of everyday details, this account of the events that led to Taiwan's first case of juvenile homicide (the fatal stabbing of a 13 year old girl by a former classmate in 1960) features no less than 100 speaking parts and nearly as many settings; while it's near-impossible to follow everyone and everything going on, the sense of time and place is staggeringly rich and unforgettable. One gathers a world of information about what Taiwan was like in the early 60s, especially for teenagers, their dreams and lusts and the codes of conduct that barely held them back; and yet what remains crucial to the experience of the film is the feeling of something painfully missing in this world, an aching sense of incomprehension over what's going on, exacerbated by an absence of parental, governmental or moral authority, and how these absences cause the innocent hilarity of childhood to descend into helplessness and horror. A film that ties together Elvis Presley with a teen massacre involving samurai swords wields a mysteriously lingering sense of universal menace that cannot be summed up in one paragraph. An indispensable achievement. If Yi Yi left me with a slightest hope that I could make a film of that caliber, A Brighter Summer Day left such aspirations in the dust. As other films of his came my way, something of the personality of Yang began to materialize. When I saw The Terrorizers (1986), it was clear to me that he had seen Bresson's L'Argent (1983), one of my own favorite films, given how similar the films were in rhythm, structure and feeling. There was so much rage and despair evident, feelings that I could relate to in feeling that I was getting nowhere with my own films. Why would someone as accomplished as Yang feel that way? It was true of Taipei Story (1985) as well, when I saw it at Anthology Film Archives' 2005 retrospective , in which a third of the films on the program never showed up. The reason being that Yang himself was the primary source for many of these prints, and already back then he was battling for his life against the cancer that would eventually claim him. But Taipei Story had made it over, and it featured a phenomenal lead performance by Hou Hsiao-Hsien as a former member of Taiwan's Little League Championship team, now a washed-up has-been till addicted to baseball and a half-baked dream of making it in the U.S., watching imported video recordings of Major League games compulsively while the world passes him by. Yang is so painfully good at painting Taiwan to be a boulevard of broken dreams and fragmented distractions swirling around a moral and spiritual void. Each time I visit Taiwan, his vision just seems to get truer and truer. The last time I visited Taiwan was in June 2005, a trip that my then-wife and I had planned for months, until our relationship suddenly grew sour. We still went on the trip, which turned out to be the point of no return in our marriage, even as she was meeting my grandparents and other family for the first time. At some point during this surreal nightmare of a family reunion/ marital breakup, I came across a newspaper headline with those same three characters that Lee-hom had written for me: Yang De Chang. I asked my grandmother to read the article. She read that Yang was now happily married to concert pianist Kaili Peng and has been working on his new project, an animated kung-fu feature with Jackie Chan. There was no mention of his cancer. But as I listened to my grandmother reading the article, I remember something he was quoted as saying and thinking to myself, "This guy is still not happy." That sense of despair and futility and barely repressed rage that you see in his films... not knowing anything about the man, I wondered how much of that was in him, and how much of it could ever be palliated over time. I guess I wondered about this because I saw a lot of myself in those films and in his life: caught between cultures, wanting essentially to do good and follow that steady Confucian path to success and happiness; and yet being all too conscious and susceptible to the pieces of life that just don't fit; the loose fragments, blind corners and countless inequities of contemporary civilization. He was a highly accomplished computer engineer who became obsessed with identifying the bugs in human society, and his quest led him to elucidate the darkest depths lurking within the cracks of life's casual insanity. He's gone now, but his films remain as a testament to how humankind can render the most beautifully structured stories to describe the madness of its own life's patterns.